Echo Rowing is known for its innovative designs and features that combine unprecedented ease of use with extraordinary stability. Our easy-to-handle shells enable you to enjoy exploring large bodies of water and varied coastal environments with confidence, knowing the Echo can handle chop, wakes and swells. The Echo's distinctive features make our shells portable and easy to launch from any beach or dock. Whether for pure pleasure or for the reward of a high-burn, low-impact workout, Echo makes rowing a life-time sport for anyone who loves both being on the water and outdoor fitness. Our unparalleled experience in design and construction becomes your exceptional experience on the water. 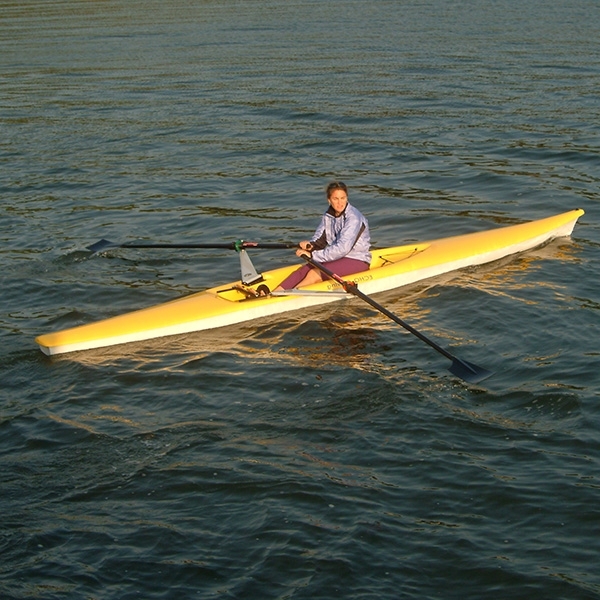 The Classic is great for all rowers - beginners to Olympic Gold medalists. With proven stability & ease of use, she maintains traditional wooden foot clogs & fiberglass seat, giving the curvy lines of this shell a timeless look. The Echo Sport is lightweight & easy to handle. It's smooth, fast and responsive in all water conditions. Our folding rigger system makes setup a breeze! Carbon fiber components add an innovative touch. The Islander utilizes the same proven hull and folding riggers as the Classic. The enlarged cockpit gives way to its watertight storage fore an aft, making overnight touring, fishing and camping a breeze. The Echo Classic with grey fiberglass seat, wooden-clog foot stretcher. Available in red, yellow, smoke white, and gull grey. The echo Classic integrates numerous functions within its flowing lines. Designer Doug Martin's simple hull form is easily driven in flat water while the 21" waterline beam is reassuring and stable in rough water. Leaving a remarkably small wake at normal rowing speeds, the Echo Classic will rise and skim like a boat. The long built in keel is designed to keep the Echo tracking on waves, preventing the wind from blowing you sideways. The Echo Sport with carbon fiber seat, foot stretcher and deck stripe choice of color: navy blue, olympic blue, aqua blue (shown), red, brilliant orange, day-glow yellow. The echo Sport integrates numerous functions within its flowing lines. Designer Doug Martin's simple hull form is easily driven in flat water while the 21" waterline beam is reassuring and stable in rough water. Leaving a remarkably small wake at normal rowing speeds, the Echo will rise and skim like a powerboat when pushed by a strong rower. The shell is designed around the Echo folding rigger system. Left completely rigged, it is easily transported by one person using the folded riggers as the carrying handles. The Echo Islander with storage fore and aft (shown with tent). Available in yellow, red, and wasabi. Travelers, adventure and long distance rowers choose the ISLANDER. Lightweight, easy to maneuver, the Islander proves itself to the challenges of sea and land. Watertight storage offer ample space to store camping gear and long overnight adventures. With enough storage to carry a week's worth of gear, the Islander has two water-tight cargo ports designed for awkward gear. Two seven and a half inch water tight Kayak Sport hatches allow full access to both ends of the shell. A six foot fishing pole easily stows forward with room for tackle or camping gear. The Echo Folding Rigger System is Echo's single greatest innovation, making rigging, transporting, and storing a breeze! 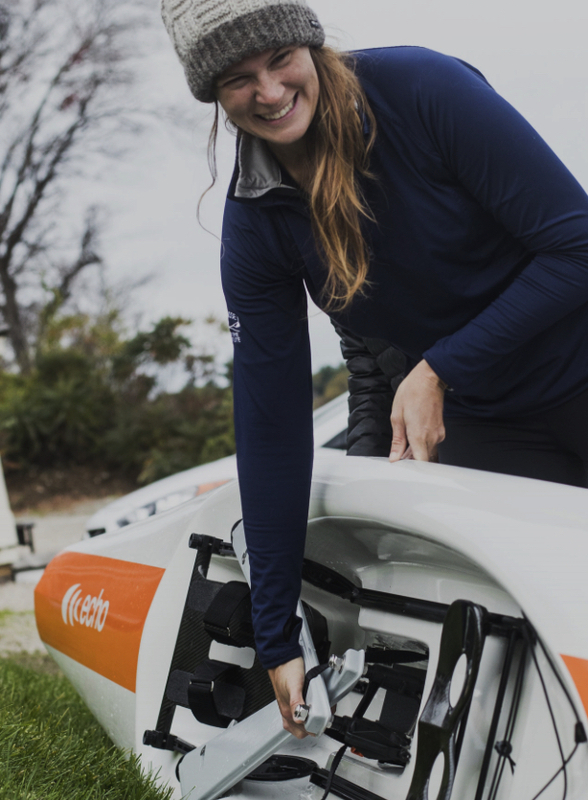 In under 20 seconds, the riggers can be unclipped, folded into their rowing position, and fastened down with the "E" clip, putting the rower on the water with more convenience, speed, and ease of mind. There is more than meets the eye to our folding rigger. In addition to folding into the cockpit when not in use, getting them out of the way, there is a strap that holds the two riggers together in the middle, securing the riggers so they do not rotate out and into the way. The clip on the strap also is a Coast Guard approved whistle, ready and waiting should a rower need to call for assistance. The real beauty is that the exact crossing of the two riggers creates a handhold, so with one hand a rower can grab the crossed riggers and lift the Echo, allowing the rower to easily carry the shell one handed to or from the shore. And by design, the exact center of mass of the shell is where these two riggers cross, creating a balanced hand hold so that balancing one handed is easy. The Echo's Folding Rigger System lays testament to design simplicity that combines practical experience, sound principals of physics, beauty, strength and practicality.